Piqua, Ohio, August 25, 2014 – Hartzell Propeller Inc. has received Supplemental Type Certificate approval from the Federal Aviation Administration for installation of the company’s new Swept-Tip Trailblazer propellers on all Aviat Husky utility aircraft. The two-blade, 80-inch diameter next-generation advanced structural composite Hartzell Trailblazer swept-tip prop can now replace Hartzell’s aluminum constant-speed propeller which comes standard on the latest Husky models. 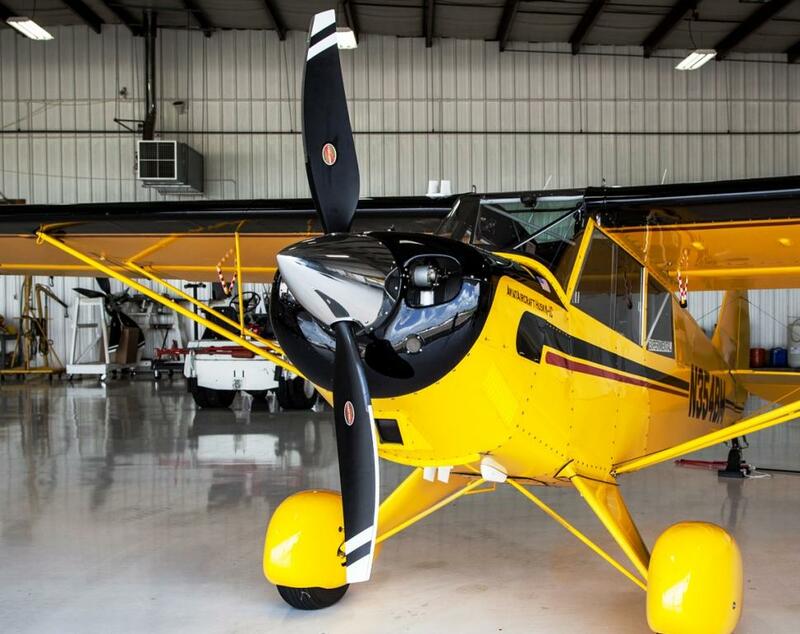 “At Hartzell Propeller we recently unveiled two- and three-blade versions of the new swept-tip Trailblazer prop for experimental aircraft and a number of certificated aircraft models built for backcountry flying,” said President Joe Brown. “The Trailblazer prop has exceptional performance. I fly this prop myself and one of my friends put one on his Husky to evaluate performance. He saw impressive gains in acceleration, climb and cruise speed. The Husky cooled better, too,” he added. The new Trailblazer provides more than a 10 percent increase in climb performance compared to the original 76-inch aluminum propeller, and a 12 percent reduction in takeoff distance at max gross weight. The carbon-fiber propeller complies with the latest FAR 36 noise restrictions on the Husky at the maximum rating of 2,700 RPM. The Trailblazer’s ability to operate at maximum RPM provides the Aviat Husky the optimum takeoff and climb performance in a globally noise compliant, eco-friendly propeller package. The Hartzell Trailblazer’s all carbon fiber construction features a field replaceable nickel-cobalt leading edge, ensuring it can withstand demanding backcountry and bush flying. The carbon fiber structural composite construction is more than five to 10 times stronger than beech wood and spruce, respectively, and includes Hartzell’s state-of-the-art wedge shank blade retention design. The new Hartzell Trailblazer swept-tip propellers maximize performance of numerous aircraft, both certified and amateur built, specifically designed for bush and backcountry flying. The two-blade version is compatible with most Lycoming 360 and 390 series engines, and requires no placards or restrictions. The three-blade version is designed for use in higher horsepower applications. In addition, Hartzell Propeller is working with numerous aircraft manufacturers to obtain approvals for installation of the new Trailblazer propeller on other certified aircraft. The two-blade configuration of the Hartzell Trailblazer propeller is available in 78-, 80- and 83-inch diameters and the three-blade configuration in 80-, 82- and 85-inch diameters. All have unlimited blade life and are approximately 20 percent lighter than comparable propellers with aluminum blades. The swept-tip, scimitar shaped airfoil is designed for optimal take-off acceleration and climb performance, resulting in an increase of 80-100 fpm climb rate versus that of a three-blade wood core propeller. The thin, stiff airfoil design, only possible when utilizing aerospace composites, allows improved low speed thrust while achieving a three-knot cruise speed improvement over wood core props.